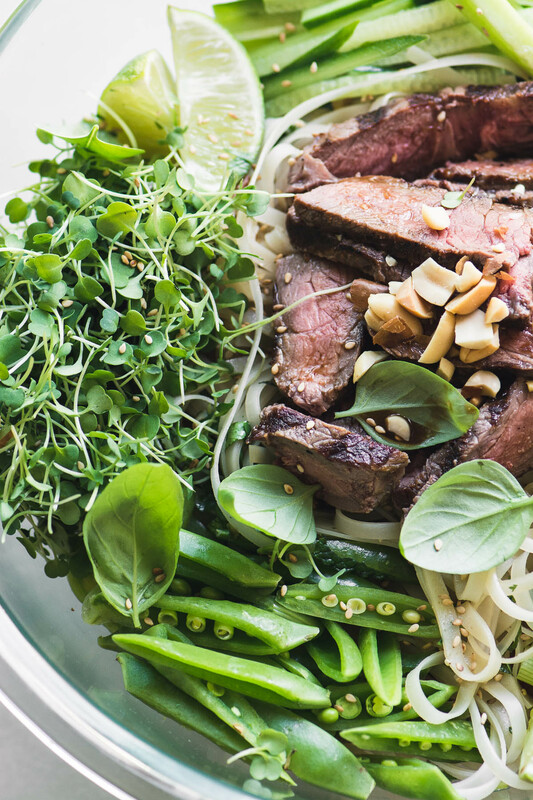 Steak Pad Thai Salad ~ a classic rice noodle bowl made into a salad with lots of crunchy veggies and greens topped off with thinly sliced grilled steak. The noodles are naturally gluten free, and the flavors really pop ~ who could ask for anything more? 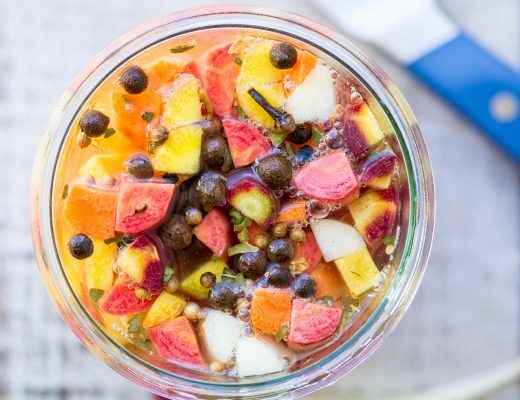 The tropics of southeast Asia have produced some of the most refreshing food on the planet. 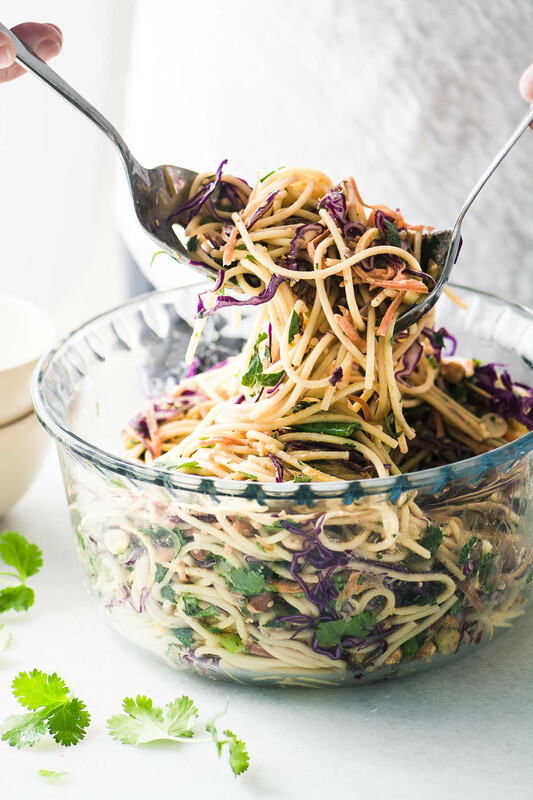 I find myself turning to Thai and Vietnamese dishes for inspiration all the time in the summer ~ today’s steak pad Thai salad follows close on the heels of last week’s summer rolls. I’ve upped the refreshment factor by turning traditional pad Thai, which is usually stir fried, into a salad. I’ve added lots of green crunch in the form of slivers of cucumber, pea pods, and green pepper. Also lots of freshness with micro-greens and herbs like basil, cilantro, and mint. Lime gives it a burst of citrus, and the slippery rice noodles? They’re like a cool breeze. Are you feeling refreshed yet? 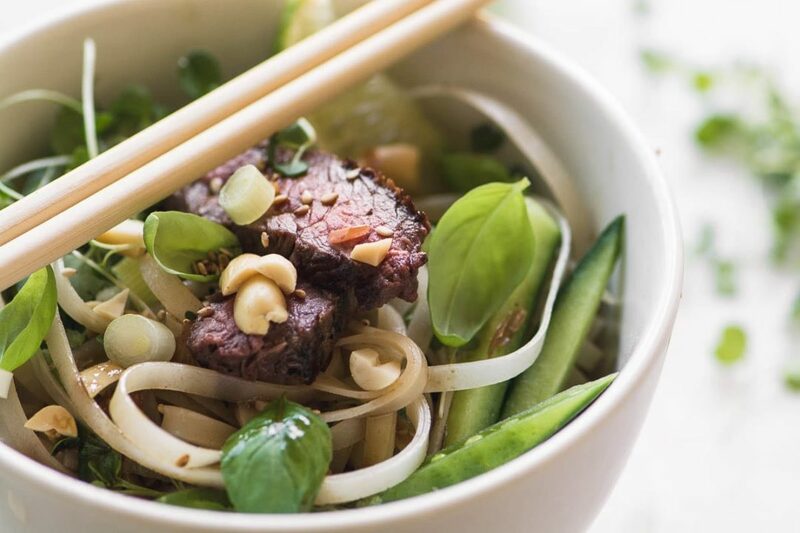 Thai rice noodles are such fun because you don’t even need to cook them, they just need a soak in hot water to soften. They aren’t starchy or sticky like pasta, either, so they’re easy to work with. Just drain them and use them right away or set them aside. 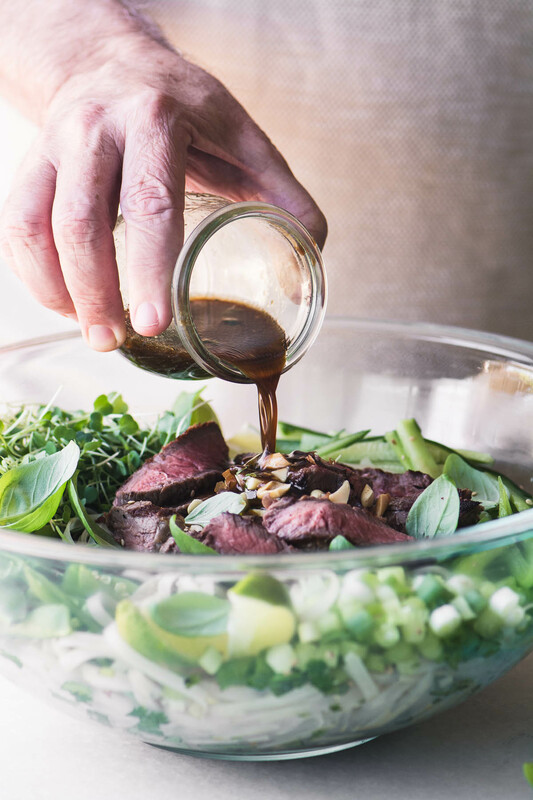 The dressing has all the classic Thai flavors, so you may want to think ahead and grab anything you don’t have in the kitchen already. You’ll find the fish sauce and tamarind paste in the Asian section of your supermarket. 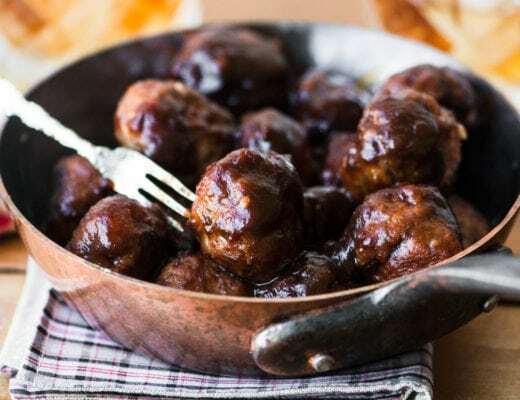 Tamarind is a tropical sweet sour fruit that’s used in many parts of the world, in fact, if you’ve had Worcestershire sauce, you’ve had tamarind. 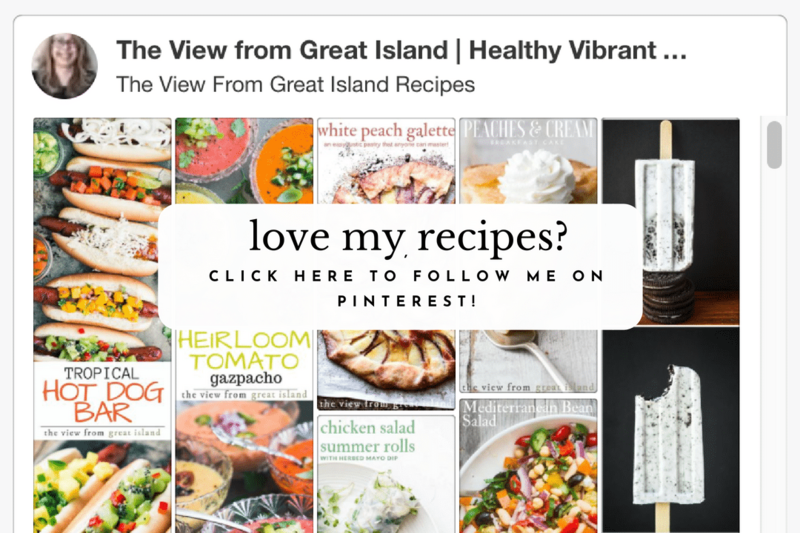 The jar of paste will keep a very long time in the refrigerator and you can use it in Indian, Southeast Asian, Middle Eastern, and Caribbean dishes. 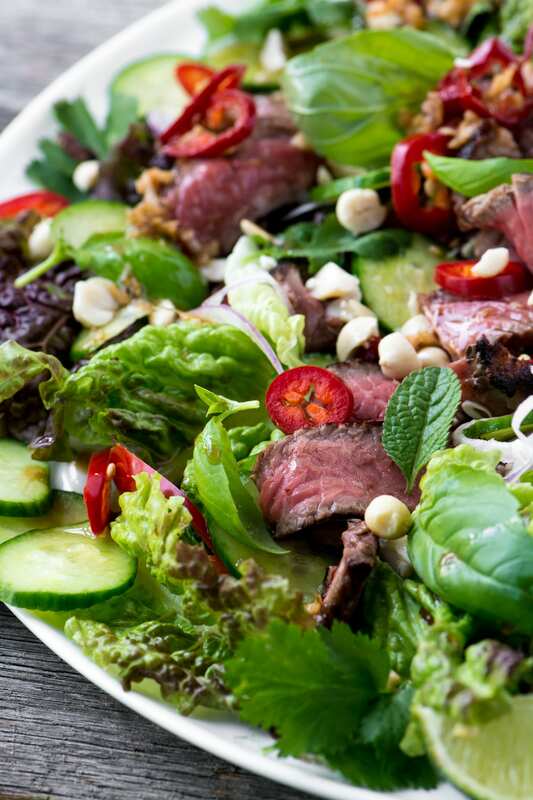 It gives the dressing for my steak pad Thai salad an authentic flavor. This riff on classic Thai flavors is the perfect thing when you want to bring something a little different to a potluck. I use spaghetti in place of traditional Thai rice noodles. This recipe is better and fresher than what you’ll find at your favorite Thai restaurant. 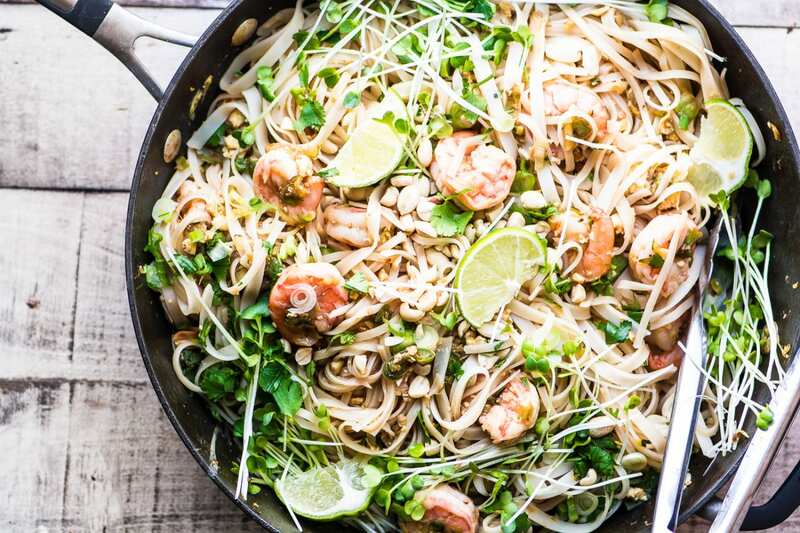 This is the more familiar stir fried version of pad Thai, it can be eaten hot, warm, or cold, making it a super versatile dish. It uses the same rice noodles that I’ve used in today’s salad. 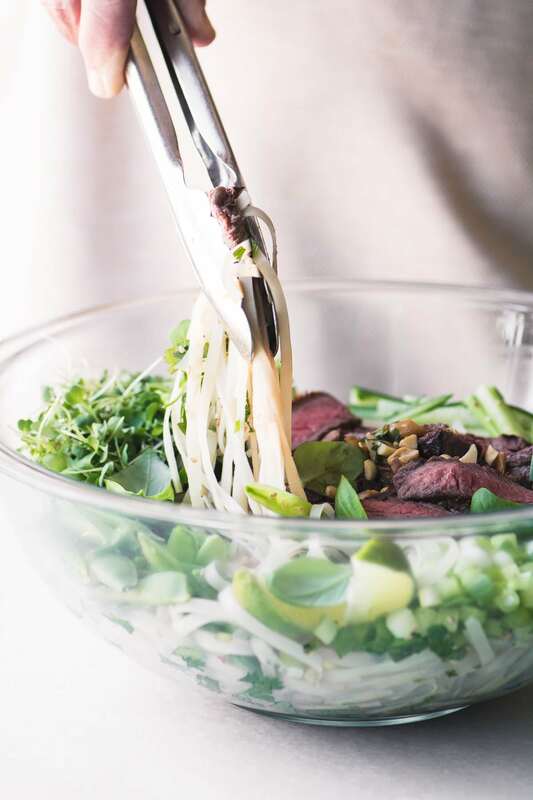 Steak Pad Thai Salad ~ a classic rice noodle bowl made into a salad with lots of crunchy veggies and greens topped off with thinly sliced grilled steak. The noodles are naturally gluten free, and the flavors really pop. 1 cup snap peas, sliced in half lengthwise, on the diagonal. Occasionally I notice that the soaking directions on Thai noodles aren't accurate, and I end up with stiff noodles. 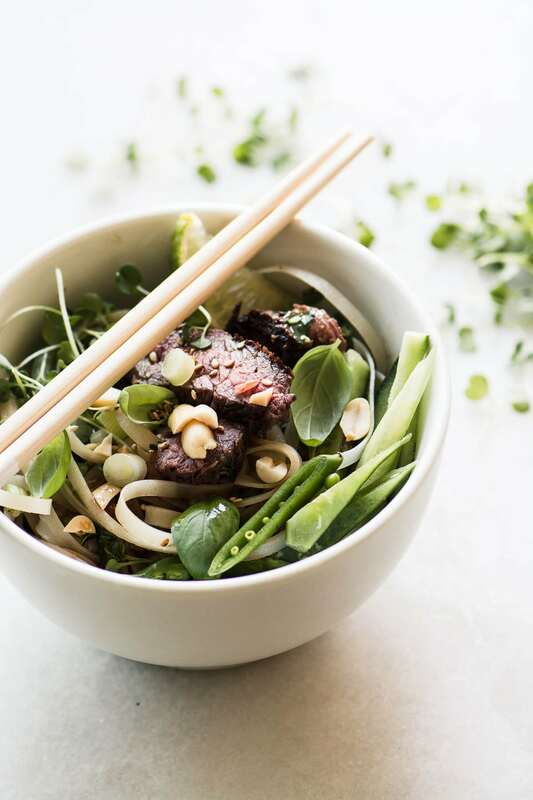 Taste your noodles after soaking and if they aren't perfectly soft, hit them with a quick dousing of boiling water...that will instantly soften them, then drain and proceed with the recipe. 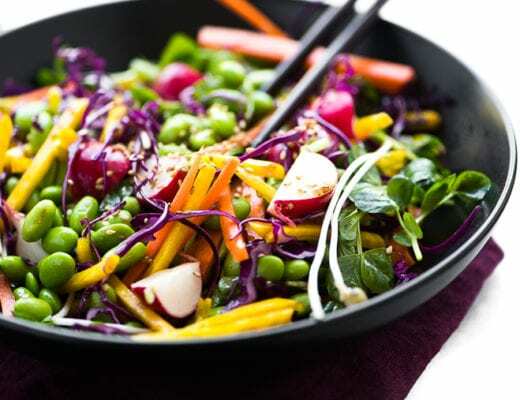 Make it vegetarian/vegan ~ use form tofu, omit the fish sauce and use more soy sauce..
Make it spicy ~ add a finely diced jalapeño pepper, with seeds, to the mix. For those who cannot easily find fish sauce, I have substituted Worcestershire sauce and it is okay. But, the right fish sauce is exactly right. 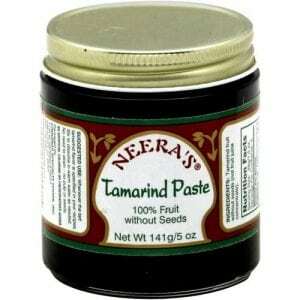 The link to the Tamarind Paste on Amazon isn’t right. Just in case you want to fix that. Thanks so much Lisa, I just fixed it!